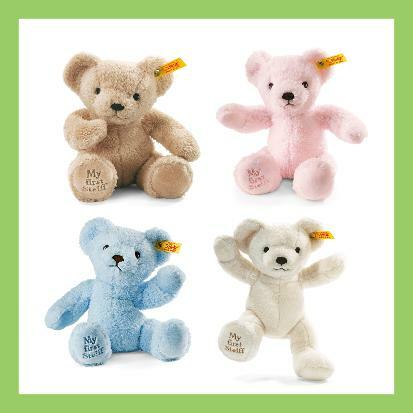 A 10" soft unjointed bear, the perfect gift for the new baby! Eyes are embroidered for safety. 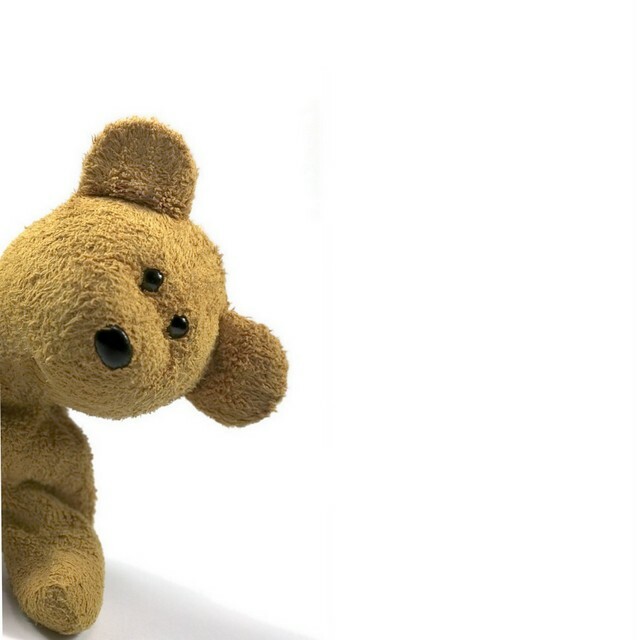 "My First Steiff" is embroidered on foot. NOTE: BEIGE is currently on back order. If you purchase beige, we will ship as soon as it arrives! Need gift wrap? Leave us a note during checkout if you'd like us to send your bear gift-wrapped. We will include an enclosure card, so be sure to let us know what you'd like to say & we'll take care of the rest. These adorably cute mini animals are perfect for baby play. With rattle and rustling foil, they'll keep your baby entertained. Washable plush fabric and embroidered eyes. Secure Steiff logo tag in ear. About 4 inches in size. These adorably cute grip toys are perfect for baby play. With rattle and easy-hold shape, they'll keep your baby entertained. Washable plush fabric and embroidered eyes. Secure Steiff logo tag in ear. Each grip toy is $20. 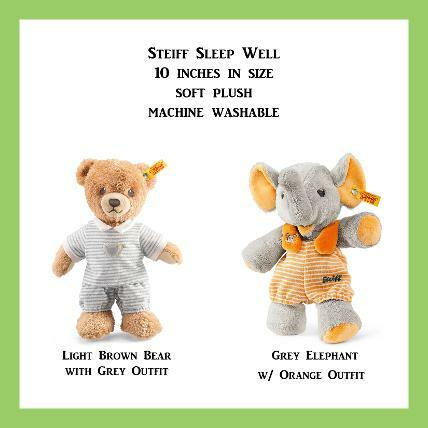 These adorably cute and soft stuffed animals are the perfect size for baby play. Washable plush fabric and embroidered eyes. Secure Steiff logo tag in ear. *Not to be used in the crib while your baby sleeps. Current recommendations are to keep all soft toys and bedding out of the crib while baby sleeps. NOTE: ELEPHANT is currently on back order. If you purchase now, we will send your item as soon as it arrives! 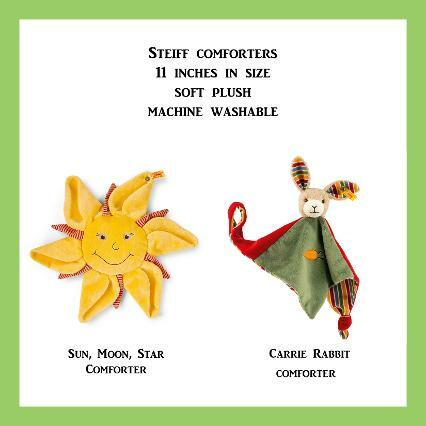 These adorable comforters are the perfect size for baby play. Washable plush fabric and embroidered eyes. Secure Steiff logo tag in ear. The sun comforter has a squeaker. The rabbit doesn't have any sound device.